The former members of The Princess Staff Club donated the retired organisation’s remaining funds of $33,300 to four local charities. 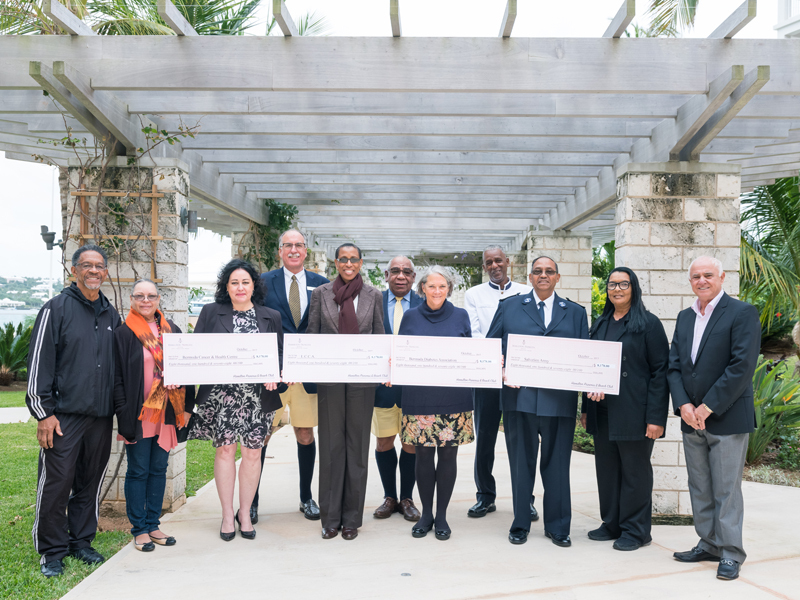 The four charities chosen are the Bermuda Diabetes Association, Bermuda Cancer and Health Centre, Salvation Army and The Lady Cubitt Compassionate Association [LCCA]. These charities were chosen by former members of the Club who are still working at the Hamilton Princess & Beach Club. Each group was presented with a cheque for $8,326. The Princess Staff Club was a sports and social club for hotel employees which operated from the 1960s through to the 1990s. As part of the Club’s social activities, a bank account was set up to fund social events and sporting teams, which used to play against other hotels’ employees. The decision to donate the Club’s remaining funds was taken after the sole remaining signatory of the account left the hotel. Allan Trew, Director of Community Relations, at Hamilton Princess & Beach Club, said: “We are delighted that the remaining funds from the Princess Staff Club have been donated to such worthy causes. Very admirable of the former staff members. Pray the funds will be utilized the assist the various charities to help those in need. Hats off fantastic gift to help those who may need a hand up. Commendable. Bermudian hospatility!! !